OK! With that playing in the background, let me indulge my inner grandma and share some pics from the trip! First thing we did--literally, as soon as we dropped our bags in the hotel room--was hoof it to the piers and get on a Circle Line Cruise. I know. Cheesy. Tourist-y. BUT. I had ridden in a car, van, bus, plane, and train in one day, and all I was lacking was boat. So off we went. One of the first things we saw was the beautiful statue of liberty. I had better pictures, but I like this one the best, with the sunlight and the glittering water. This man was so funny! He'd just caught a fish, and wanted to show it off to everyone on our boat. This is something new I learned on the Circle Line Cruise--at the top of the island, there's a recreation of a medieval cloister, complete with medieval era plants in the garden and tapestries on the wall! Now I realllllly want to go, but it's a long way from downtown. One of my fave pictures--the sun setting over Washington Bridge. After this, the husband and I both crashed in our hotel--that was a long cruise following a long day of travel. And beside, the next day was ComicCon! Check it. I totally caught a bird in the upper right corner! Awesome. 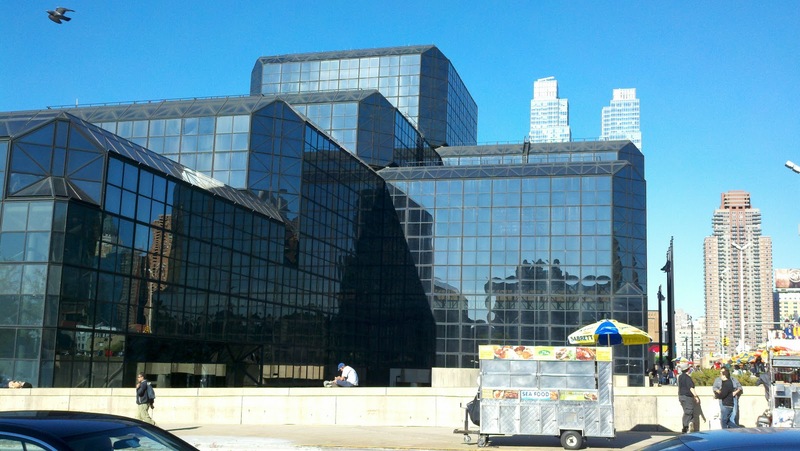 ComicCon takes place at the Javits Center, this colossal black glass building that is a labyrinthine maze inside--or, at least it felt that way as we waited HOURS to get in, despite the fact that we'd already bought our tickets online. But it was totally cool with me, because I got to speak at a panel (so cool!) and had a few people stop me and ask me to sign their ARCs (even cooler!). Evidence of the crowdedness. Interesting sidenote: my phone's camera can do panoramic shots! Be prepared for more similar. Clicky through for bigger picture. Yes. I love Kingdom Hearts. 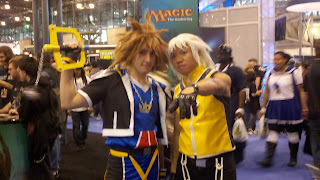 There were many Sora costumes, but this was the best. And don't you love the pose?! PS: Yes, I'm a great big nerd. 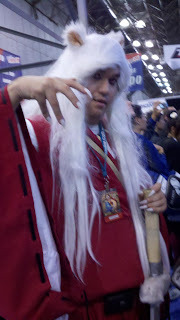 This is Inuyasha. 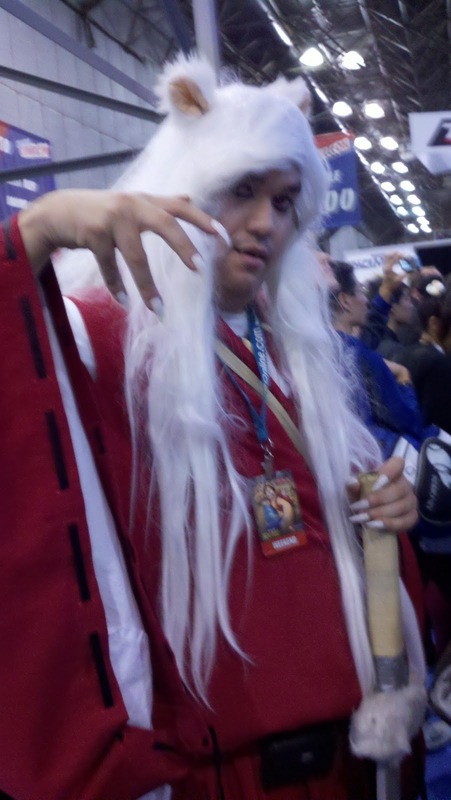 If you don't know Inuyasha, YOU SHOULD. I TOLD YOU I WAS A NERD, OK? All right, just in case you don't know--this is Princess Serena. From Sailor Moon? Yes, I'm old-school nerd. And yes, I totally noticed that she even did the classic Princess Serena pose. OMG this was by far my favorite costume. On Sunday, I took the husband off to...NINJA NEW YORK! Many of you will remember that I've long said I wanted to go there if I ever got an agent/book deal/a good enough excuse to go to NYC. And now I've been! It was AWESOME. It was SO SO SO AWESOME. The husband and I ordered food for every course, even dessert (rare for me) AND we ordered the special ninja-style food for every course (read: special effects food). Imagine this sign turned around right-side up. But I wanted to include the pic, because it pretty much sets the scene for the restaurant. They really do the place to look just like a real Japanese town. There were cute little pumpkins carved alongside all the Japanese decor! My first course. On fire. Shared appetizer. It smoked for a good ten or fifteen minutes. Corwin's second course. Also on fire. For the record, Corwin let me die THREE TIMES. I cannot trust him anymore. After ComicCon, I drug my husband to the American Museum of Natural History. Yes, drug him. Because, see, he knows I'm a nerd. And he gets bored easily. And his idea of fun does not include museums. "But," I said, "you've not seen anything as cool as THIS museum." I told you I liked the panoramic feature! Clicky to embiggen. This room was so cool. Dead creepy crawlies and stuffed animals everywhere. I loved the swirl of butterflies on the right. This cloth is made of SPIDER SILK. Awesome. Corwin meets a long lost ancestor. And then, of course, we got to the dinosaurs. And the husband was in utter awe. This turtle was so big you could RIDE HIM. I mean, you could ride him if he weren't dead. Check out the brontosaurus! So huge he'd barely fit in the picture. You know those creepy stories about antlered fairy men? I imagine THESE antlers. After the museum, I made Corwin do a bus ride. I know, I know. Touristy. Yeah. But whatever! The bus ride we took was called The Ride, and it's brand new--as in, it's only been open a few weeks brand-new. AND IT ROCKED. Seriously. Don't be a touristy snob like I usually am. DO THIS. It was SO MUCH FUN. But it's NOT a normal bus. The bus from the other side. Notice the full glass windows. Inside, the bus has three rows of stadium style seating that faces one direction. One entire side of the bus and half the ceiling is glass--so as you ride, you get a full view of what's in front of you. The bus from inside. Tilt your head. Sorry about that. ...or who otherwise interact with the bus. For example, outside of the Ritz, a fake paprazzi flashed pictures of the bus and pretended as if we were celebrities. A street delivery person dropped into a break dance routine. You never knew WHO on the street was a performer, and who was just one of the hundreds of bystanders in NY. In one really funny scene, we drive down a street that looks fairly normal and boring. We're told that someone on the street will remove something. We're looking at the dozen or so people walking down the street, and one man takes off his hat. Then we're told he'll remove something else...and he takes off his wig! Then...we're told he'll remove one more thing...and as he's walking down the street, he rips his pants off! It was truly hilarious and unexpected--and even better was to see the regular New Yorkers just look at him and shrug as they went on with their day. It started raining heavily, so my picture didn't turn out well. But here, a ballerina and her partner danced in a circle as The Ride went around Columbus Circle. It was magically beautiful. And, of course, I couldn't do all the touristy stuff without also doing the Empire State Building. Now I'm singing "Empire State of Mind." I hope you're happy, Alicia Keyes. The Empire State Building was just fun. I'd been before, but it was the husband's first time, and we hit a great time of day--just as the sun was going down. It wasn't too crowded, it was still light, and there was still a bit of romance as the buildings' shadows lengthened. The real reason anyone goes into the Empire State Building: to see the much prettier Chrysler Building. Manhattan, with the Statue of Liberty. Lookit! The shadow of the Empire State Building! And that was it! My grand NYC adventure! I know some of you are thinking--but what about the publisher stuff?! And yes--I did get to meet my wonderful editor and everyone else at Razorbill (hi everyone!) and it was BRILLIANT. And I met my wonderful agent (hi Merrilee! hi Jennifer!) and it was also brilliant (and the Writers House offices---gorgeous). And I ate so much delicious food I'm surprised I lived to tell the tale. But...uh...I didn't take any pictures of that. But I felt like such a greenie, I couldn't just pop out my camera and say "cheese!" in front of all these uber-cool NYC peeps, could I? But here you all go! My awesomely amazing NYC adventure...sans the publishing stuff...with extra touristy stuff added! Awesome! Thanks so much for sharing! It looks like you had a fabulous time! This is such a fun post! Thanks for sharing the pictures! :) So glad you had fun meeting Team Awesome (i.e. your publishers/agents) and doing totally un-lame touristy things! You made my night with the princess Serena picture! Thanks for taking the time to share your trip. Sounds like you and the hubster had a fab time! I love New York. THanks for letting me revisit it vicariously through your pics. I am not an crack on this but I like your post. Wow! I hope I can go to New York one day! It looks beautiful. Totally awesome! Obviously you had a grand and wonderful time! I am so jealous, Beth. I've never been to NYC and it looks fantastic! And the Ninja Restaurant! you did tell us that you were going to go there, and it looked awesome. I'm green with envy over here in the UK. So much fun! And for the record I'm a HUGE Sailor Moon fan. You're not alone! I loved the rainy ballerina shot! It was magical in every way. This post made me feel I was there and that was gooooooood. I'm so happy you had a great time. So glad you both had such a good time! 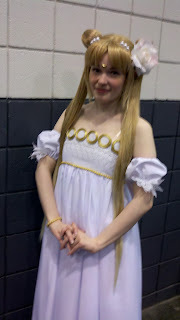 And word about finding the Princess Serena girl! I went to Comic Con in San Diego this summer and got super excited every time I saw someone dress up as one of the Sailor Scouts. That show was like, 2 full years of my life. So cool!! I love New York! So glad you had fun- and next time takes some picks of your agent and editor!! I would totally have gotten picks with mine and framed them and put them on my night stand...ahem. I am SO geeking out over the Princess Serena. Man! That would have ROCKED. NY looks like it was AWESOME and I'm so glad you had a great time! This was an adorable post, Beth. It's hard to remember to do all these quintessential NY things unless...you are visiting! I wish I'd had a chance to meet you but understandably, you looked like you had a fun but superbusy time. Hopefully our roads will cross again soon.